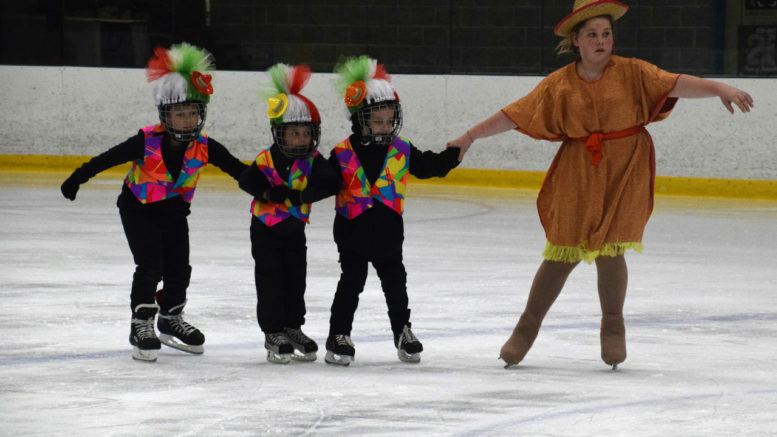 Dressed as trolls traveling the world, Carter Genereaux, Carson LaLonde, Nathan Swartz and Eden Freeman perform a group skate during one of NDSC's carnivals. Photo by Adam Prudhomme. Rising ice rental fees coupled with dwindling registration numbers forced Napanee District Skating Club to have to forego their annual year-end carnival showcase in March. The club says they may have to do the same again next year unless they can work out some kind of agreement with the Town of Greater Napanee. Last Tuesday NDSC executive member Jill Woodall spoke before council in hopes of finding a solution that would allow the club to remain active and host a year end event. Deputy mayor Max Kaiser, filling in for the absent mayor Marg Isbester, put forward a successful motion that the club meet with the town’s facility office clerk Chris Brown in an attempt to come up with a solution. Woodall says the town’s recent decision to raise prime time ice fee rentals up to $162 an hour could ‘effectively cripple’ NDSC. Woodall says the club is already stretching its fundraising to the limit in an effort to cover costs. As the date for the annual carnival drew nearer, the club made the decision to not hold the event. Woodall says the $4 an hour increase may not sound like a lot, the fee of $162 per hour can work out to about $27 per hour per skater as their numbers continue to drop. Being an individual sport, figure skating doesn’t have the registration numbers like a hockey team would, leading to the higher fees per member. Woodall was hoping the town would consider a more number-based increase or to consider some form of waiver based on participation numbers. The executive will meet with town staff and come back to council with their proposal at a later date.